Catignano is a little hamlet in Gambassi Terme’s commune, a village which has maintained intact the typical profiles of a medieval installation with time, a place of pure and old Tuscany, placed on the ridge of a hill which dominates Val d’Elsa (Elsa Valley). 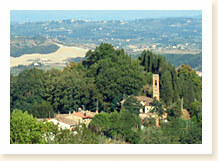 All around, the village is ringed by vineyards, olive groves and typical oak trees, ilexes and cypresses woods. 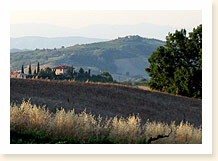 If you want to live Tuscany’s authentic spirit, you can stay here sharing rural life of country folks, you can walk relaxing among country tastes and flavours and good food. The village, placed in Tuscany’s heart, bordered on the provinces of Siena and Florence, is fit as base to visit art towns , romanesque parishes along the Francigena way and medieval castles placed in the neighbourhood. 5 km from Catignano, in the middle of Gambassi Terme, there are thermal baths where you can drink pure spring water and relax in the health centre.